There’s an obvious ease about Haddon Heights’ Station Avenue, the perfect, relaxing main drag. On a summer night you’ll always find a cache of locals up and down the avenue, enjoying the cool of the setting sun with a bite to eat. So when one of the avenue’s longtime fixtures, Elements Café, shuttered last winter, people were left hungry, but not for long. Just days later a new generation of creative minds stepped in, and with that C.C.’s Kitchen was born. C.C.’s is a Mediterranean-inspired BYOB run by lifelong friends Matt Salvitti and Tyler Serenelli, who both came up in the restaurant industry cooking right on Haddon Height’s main street (Serenelli as a cook with Elements and Salvitti across the street at Anthony’s Creative Italian Cuisine). They named the space after Serenelli’s mother, Christine, and Salvitti’s grandmother, Carmelyna, who have both passed away and inspired the food coming out of the kitchen each night. The interior itself is very bare bones, with bistro chairs, black clothed tables, commissioned local art and not much else. Its simplicity did not match what was an impressively extensive menu of seasonal, from-scratch plates, with a large, vegetarian-friendly selection and house-made pastas. At the time of our initial visit we were catching the tail end of the spring menu, made clear by the ever-present chef Salvitti who excitedly ran through his much-anticipated, veggie-heavy summer menu between darting in and out of the kitchen with fresh dishes. So to return and see how the menu has been updated for the warmer months was a real treat. First came the agnolotti, a starter of pasta stuffed with spring peas and fresh ricotta, which was then pan-seared and served on a bed of cold black sesame yogurt with pickled carrots, snap peas and slices of fresh radish. A hot-and-cold pasta dish isn’t something you see every day, but the balance of textures, temperatures and flavors was exciting and fresh. The creamy yogurt mellowed out the piquancy from the pickled veggies, which all came together with the soft pasta. It was just the right bite, especially for the time of year. 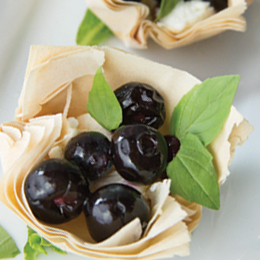 Another starter arrived via the phyllo tarts, bite-sized cups of phyllo cooked until brown and filled with citrus-poached blueberries, goat cheese and lemon basil. Once again, the flavors were delightfully balanced, and only added to the already solid start to the meal. The scallop entrée came beautifully plated with five nicely seared scallops over sautéed rainbow chard and topped with a mango pico de gallo. There was an extra pop of flavor with each bursting bite and the citrus notes brightened up this already ready-for-summer plate. A chicken breast was seasoned with za’atar—a Middle Eastern spice blend—and served atop sticky rice with basil and garlic scape pesto. The piece of chicken that arrived was a tiny serving compared to the mound of under-seasoned rice it accompanied, the only true miss of the evening. While a larger portion would have been appreciated, there was no denying that the protein was well prepared, but that only left us wanting more. The meal was quickly redeemed, however, by a seriously strong dessert menu, featuring all house-made dishes, including several ice cream options churned in house. To get the best of both worlds try the blood orange olive oil cake, which is served with a scoop of fresh vanilla ice cream. The cake itself came complete with a mascarpone icing that paired nicely with the delicate, fluffy cake. Fresh berries wrapped up the dish, adding a natural sweetness that could have stood alone with just ice cream as a wonderful ending. It’s great to see some fresh faces on Station Avenue, and with that plenty of fresh ingredients. C.C.’s summer menu looks to take the spring plates here and turn them up to 11 with the help of South Jersey’s beautiful seasonal offerings. We are eagerly awaiting to see what they cook up next. 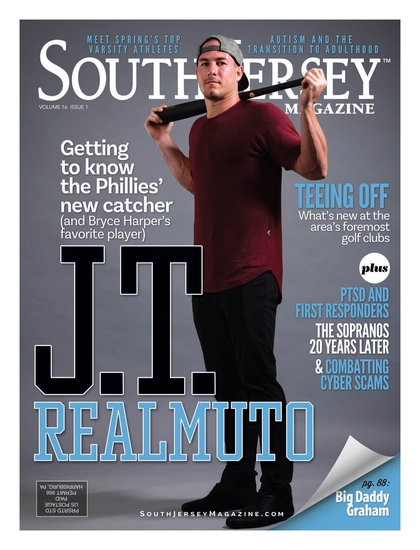 Published (and copyrighted) in South Jersey Magazine, Volume 15, Issue 4 (July 2018).